Fishermen’s Terminal is my go-to place in Seattle when I’m feeling restless and confined. Any wonder, with dozens of boats promising adventure on the high seas anchored next to concrete floating docks, the terminal is an escape ticket to boat nirvana. A beautiful sunny autumn day inspired me to visit the terminal. Because of the return of the North Pacific fishing fleet for the season, gigantic fishing boats I had never seen before lined the docks bumper to bumper, like a retail parking lot on Black Friday. Awestruck by the sight of so many massive ships, I meandered up and down the pathways to explore the amazing display of nautical might. Brilliant autumn sun brought high relief to sailor whites, clammy shadows and shimmering water reflections. I spent a lot of time photographing seaworthy themes taking care not to slip into the cold fishy water as I backed up for better angles. I finally decided to change gears and start sketching, focusing my sketching strategy on boats drenched in color or with notable visual character. While sketching, it was easy to imagine stories about fish caught or storms endured by brave mariners. 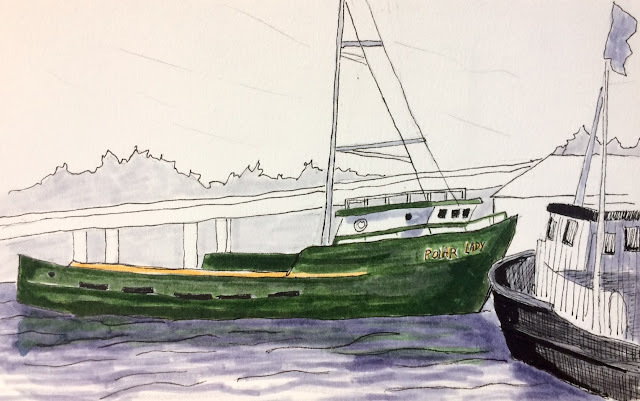 Moored west of the Ballard Bridge, long and low Polar Lady is a rich green color. 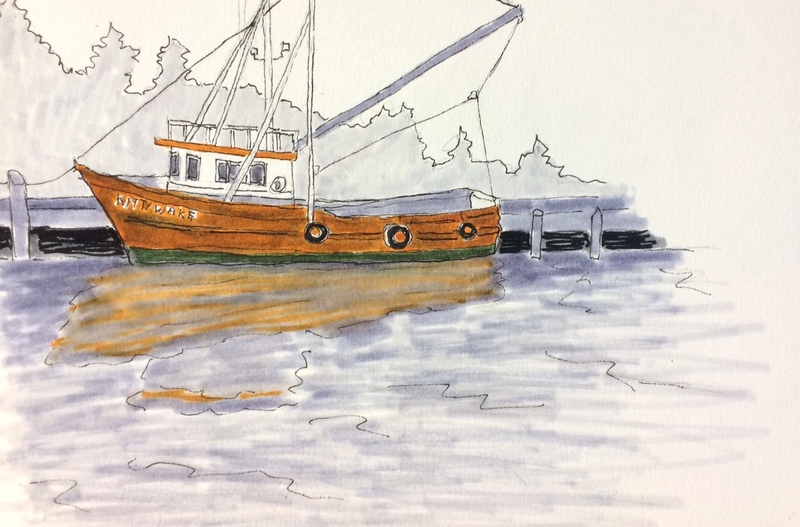 I cannot go out in a boat without getting seasick and know very little about boat design, however, I thought Polar Lady looked very stable and seaworthy. Discovery Channel’s TV show Deadliest Catch, Season 1 featured Polar Lady. Fishermen’s Terminal has a dynamic environment. 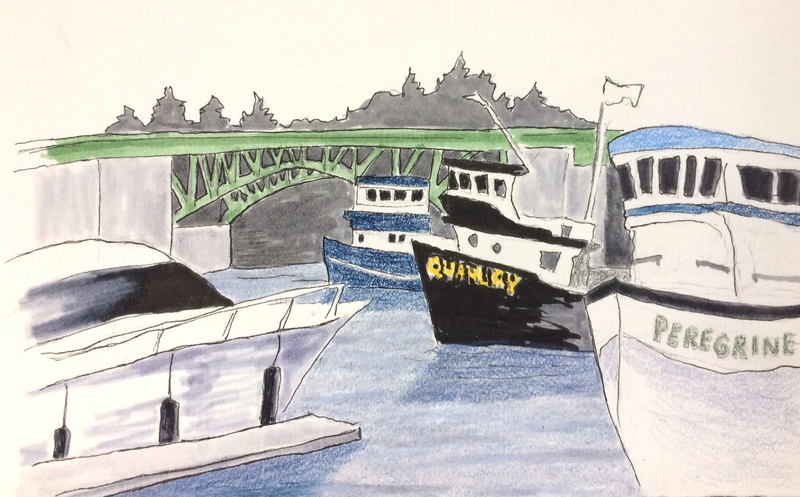 As I sketched Quandry and Peregrine, I watched the historic Ballard Bridge, built in 1917, open and close for tall boat traffic. It’s better to observe the spectacle from the sidelines or from a boat passing under than to be sitting in traffic waiting to get across the bridge! At the terminal, commercial fishing boats share space with recreational boats by choice. On the day I visited, the terminal bustled with activity. Families paraded along the docks sight-seeing, men and women strode around in neon vests hustling to get their jobs done. Restaurants, a gallery, and a fish market make it a tourist destination worthy of multiple visits. I enjoyed a bowl of clam chowder at Chinooks after concentrating on my drawings. Seattle research vessel R/V Kittiwake reflected seasonal fall colors while moored at the terminal. Great sketches, Kathleen -- you captured some of the best things about the Terminal.